Amethyst is one of my favorite stones to work with both because I love the color of the stones as well as the feel of them at my fingertips. When i came across this large faceted coin in amethyst I was immediately inspired and the design was already building in my mind even as I paid for the gorgeous stone that would be it's focal point when finished. In this one-of-a-kind amethyst choker, a large faceted coin of genuine amethyst is joined with matching amethyst rounds in varying sizes. 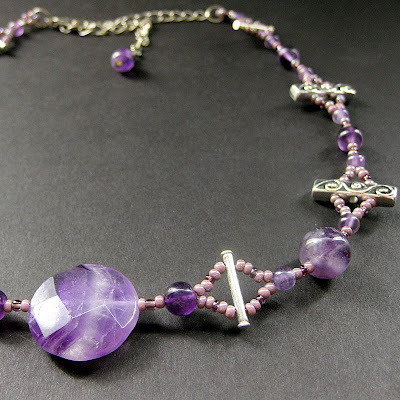 The handmade choker is then brought together with matching glass seed beads and pewter accents. The lobster claw clasp at the nape of this handmade amethyst necklace hooks to a chain that allows this choker's length to be adjusted in size between 14" - 18" in length (35.5 cm - 45.7 cm) for the perfect fit possible while a small amethyst stone bauble at the end of the chain gives an extra bit of decorative touch.